At Parmelee-Hill we are as hands-on as one can get. Every attention to detail given. The vines are pruned to a good balance using previous crop yields and brush weights. Discing and mowing are used as tools to slow vines down or stimulate vine vigor. 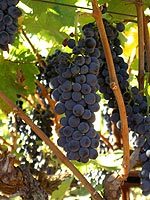 Vines are routinely thinned to ensure bunches are only hanging on the strongest shoots and are not bunched up together, reducing light exposure. Moderate to heavy leaf removal is practiced depending on the block and fruit exposure desired. Optimum yield for Parmelee-Hill Syrah blocks ranges from 2.5-3.5 ton per acre depending on the year and the block. We do not try and artificially reduce yields, rather let the vine and the year dictate carrying capacity. The last line of defense to ensure that only premium fruit goes into our wine program is our harvest technique. Our fruit is hand-picked at night for better quality. Experienced crews are the backbone of the success at Parmelee-Hill. Nothing other than the cleanest, ripest fruit will make it from the field to the winery. We harvest at night when the fruit is colder and is both truer in sugar content and more resistant to being battered and split during harvest. The largest lot crushed is 2.5 tons, and most lots are harvested in one ton increments. This technique is tough on the farmer, however allows sourcing fruit from different blocks to come up with the ultimate field blend for our finished product. We also now have the advantage of experimenting in the vineyard with different practices and tasting the end product to continue to try and increase the quality of the fruit we grow. With our gravity-fed winery, the fruit is never pumped. The winery is set up in a gravity feed manner so that as the fruit runs along the sorting tables and through the destemmer it is never pumped, but falls from one stage to the next. The fruit is hand sorted once upon being dumped and on it’s way to the destemmer. After the destemmer the berries pass over a sorting screen to remove any tiny, unripe berries, and the berries are hand sorted once again as they run on conveyors to fall into the waiting fermenter. This pain-staking process ensures that only the fullest, ripest berries and nothing else make it into our wine. In the fermenter the berries are cold stabilized for about 24 hours before being allowed to warm up and ferment. Fermentation begins with indigenous yeast, after which cultured yeasts are added to complete fermentation. When fermentation is near complete the must is gently pressed using a newer style of the old-world basket press and the juice is off to barrel. The pressed wine is usually put into about 25% new French oak, with our port going into some pungets and Hungarian oak. As we continue to expand our winemaking at Parmelee-Hill we continue to experiment with different levels of oak, and techniques such as whole cluster and barrel fermenting. Parmelee-Hill wines spend about 12 months in barrel for proper aging, and 12 additional months in bottle before being released.